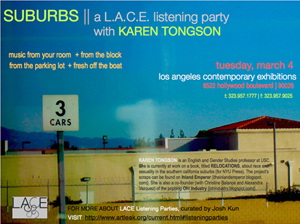 Karen Tongson is an English and Gender Studies USCprofessor at USC. She is currently at work on a book title RELOCATIONS about race and sexuality in the southern California suburbs (for NYU Press). The project’s scraps can be found on Inland Emperor. She is also a co-founder (with Christine Balance and Alexandra Vazquez) of the popblog Oh! Industry. Listening Parties are interactive public conversations curated by Josh Kun and are inspired by the current explosion of mp3 players, podcasts and other mobile media, that are used to score the soundtrack of everyday life. Each Party will feature special guest critics, musicians and curators who will share favorite recordings – from popular anthems to found sounds and new material – to serve as the impetus for this series of wide-ranging discussions about urban space and music. Party hosts will design her/his listening experience to shape how the music is encountered and to break down a traditional panel format. Josh Kun (PhD, Ethnic Studies, UC Berkeley) is an Associate Professor in the Annenberg School of Communication and affiliated faculty with the Program in American Studies and Ethnicity. Prior to joining the USC Annenberg school, Josh Kun was Associate Professor of English at the University of California, Riverside. He is the author of Audiotopia: Music, Race, and America (UC Press) which won a 2006 American Book Award. His articles on popular music, the pop cultures of the US-Mexico border, and the music of Los Angeles have appeared in numerous scholarly journals and anthologies. He is director of The Popular Music Project at USC Annenberg’s The Norman Lear Center.